Come to the Riggers Loft Wine Company in Richmond, CA. 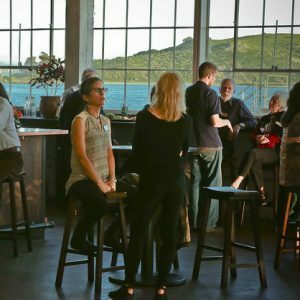 Come to where great wine mingles with delicious food, where folks can relax with friends, and where it all comes together for the most amazing view of the San Francisco Bay! Live music on Friday evenings, and often on Saturday. A Wine Collective: The Riggers Loft Wine Company is home to R&B Cellars, as well as our resident wineries: Carica Wines and Irish Monkey Cellars, and our resident “Cider Man” – Far West Cider Company. (Far West’s ciders will be available soon in the tasting room.) Choose from several different flights of wine. Or let us help you create a personalized flight. Pair your wines with a delicious cheese plate. Or choose from Paul’s “Street Eats” – our resident food truck purveyor. Live Music: On Fridays, pair your wine with some mellow jazz featuring outstanding local talent. Regular live music on Saturdays is coming soon. R&B Cellars is known for a couple of different wines. The most popular is our red blend called The Improviser. It is a Zinfandel-based red blend with five other varietals – Mourvedre, Petite Sirah, Merlot, Cab Franc and Barbera. It’s a great everyday, sipping wine and we literally cannot make it as fast as it sells. Visit our list of updated EVENTS!